Preah Monivong National Park known as Bokor National Park located in Teuk Chhou District, Kampot province. Bokor Mountain was found by the French in 1917 and developed into a resort in 1921. 500 Rice Field is 17 kilometres from the Thansur Bokor Highland Resort and takes about 30 minutes by car to reach the site. Kampot, April 2014 - Thansur Sokha Hotel has received the ASEAN Green Hotel Award 2014 as one of the best eco-friendly hotels in ASEAN. 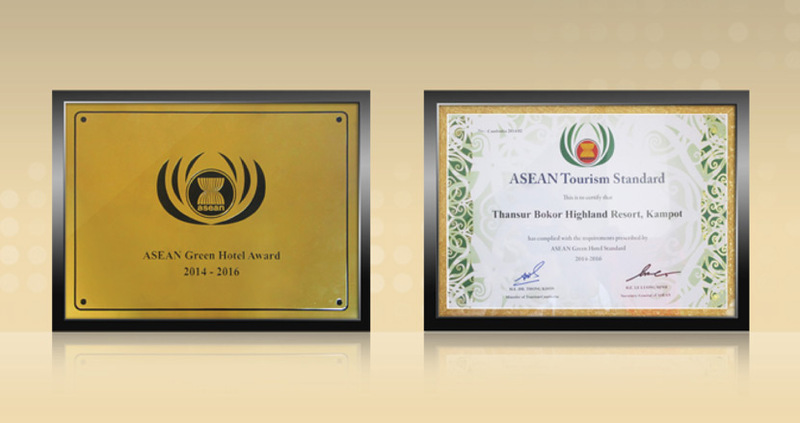 The prestigious ASEAN Green Hotel Award 2014 was presented in the bi-annual award ceremony held in conjunction with the ASEAN Tourism Forum (ATF) on 18-23 January 2014 at the Pullman Hotel, Kuching, Sarawak State, Malaysia. This award is presented to hotels, which adhere to green and sustainable practices, are environmentally friendly and adopt energy conservation measures based on the criteria and requirements in the ASEAN Green Hotel Standard, Eighty six hotels across the ASEAN region (ten hotels of Malaysia, ten of Myanmar, five hotels of the Philippines, ten of Singapore, ten of Thailand, ten of Vietnam, ten of Laos, ten of Cambodia, ten of Indonesia and one hotel in Brunei Darussalam) received this prestigious ASEAN Green Hotel Award for a period of two years 2014-2016. Kampot, September 2013 - Thansur Sokha Hotel is proud to receive "The Best Integrated Entertainment Destination in Cambodia" certificate of appreciation from Ministry of Tourism of Cambodia at the 9th International Travel Expo's Cambodia Night held at Rex Hotel in Ho Chi Minh City, Vietnam. The award recognizes Thansur Sokha Hotel as the best integrated entertainment destination in Cambodia which shown the acknowledgement quality of excellence in location, nature, entertainment, services and hospitality facilities. 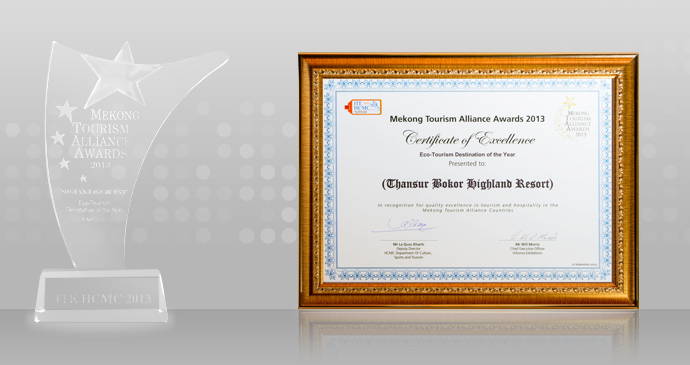 This award is a testimonial of Thansur Sokha Hotel's commitment and effort as well as a contribution to tourism industry. "This recognition has shown that we are on the right track to a positive contribution to excellence service, hospitality and tourism in Cambodia. We will do our best to keep this remark." Said Mr. Grant Jefferies, general manager at Thansur Sokha Hotel. Thansur Sokha Hotel is the latest inclusion of Sokha Hotels & Resorts offering 564 rooms & suites situated amid National Park on Bokor Mountain, Kampot province. Thansur Sokha Hotel offered many entertainment facilities like KTV, Night Club, Spa, gym, sauna, indoor pool, kids club, live band, 3 restaurants, 2 bars and many recreation activities. Kampot, September 2013 - Thansur Sokha Hotel is proud to receive "Eco-Tourism Destination of the Year" award from Mekong Tourism Alliance Awards 2013 at the 9th International Travel Expo held at White Palace Restaurant in Ho Chi Minh City, Vietnam. The award recognizes Thansur Sokha Hotel as the newest eco-tourism destination in Cambodia that identifies not only the beauty but also Cambodia's top destination of the year. The property qualifies excellence in location, nature, services and hospitality facilities. 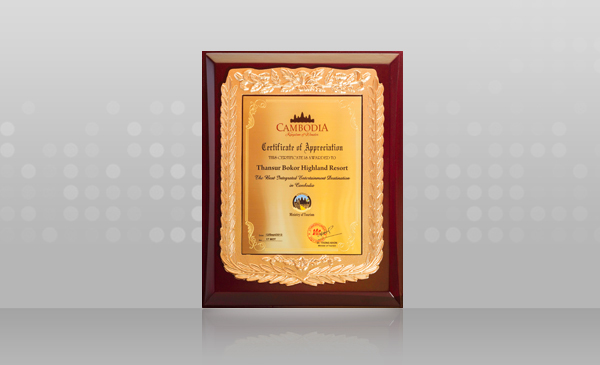 This award is a testimonial of Thansur Sokha Hotel's commitment and effort as well as a contribution to tourism industry. The Mekong Tourism Alliance Awards (MTAA) celebrates and recognizes the brightest tourism stars in the five Mekong Tourism Alliance countries of Cambodia, Laos, Myanmar, Thailand and Vietnam. The Awards aim to instill a greater sense of pride and achievement for professionals and organizations and serves as recognition for quality excellence in tourism and hospitality in the alliance countries. The awards were evaluated by the international judging panel made by Mr. Jose Filipe Torres, Mr. Mason Florence, Mr. Edouard George, Mr. El Kwang, Mr. Kyi Thein Ko. "It is an honour to receive the award showing the recognition Thansur Sokha Hotel is an Eco-Tourism Destination of the Year. This award is the acknowledgment of our resort's effort and commitment. We are going to continue our initiation and contribution for the excellence service." Said Mr. Grant Jefferies, General Manager at Thansur Sokha Hotel. Copyright © 2019 Thansur Sokha Hotel. All rights reserved. There are 3 people looking at our website. Most recent booking for this resort: less than 24 hours ago from Singapore. Don’t miss your chance to stay at Sokha Beach Resort!